A collection of the most shocking, horrifying accounts of true crime ever. Evil knows no boundaries. In 1614, Hungarian countess Elizabeth Báthory died, sealed in a tiny closet in her castle. Her crimes? She was rumored to have bathed in the blood of her victims, which may have numbered in the hundreds. More recently, Russia’s Andrei Chikatilo, the United States’ Ted Bundy, and Great Britain’s Peter Sutcliffe added to the horrors humans inflict upon their fellow man. Featuring maps, callouts, and facts that follow these criminals’ trails of crime, Evil is a groundbreaking volume. 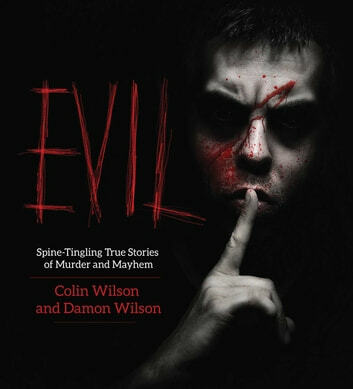 It explores some of the most famous crime cases of real-life murder and mayhem. In this epic account of history’s most infamous murder cases, leading true-crime researcher and writer Colin Wilson teams up with his son Damon Wilson to masterfully recount the shocking details of more than sixty cases of murder and mayhem. Illustrated with hundreds of color and black-and-white photos, Evil features images of criminals, forensic evidence, and key personalities and places that put each crime in historical context. In a continuing search for the meaning in murder, the Wilsons create one of the definitive books in the field of criminology.